OK, assume that you're right I still think this whole witch hunt is exaggerated for those reasons that I mentioned in my previous post. What was the deal with Gaga performing in Russia? It was a concert and she has Russian fans too. Don't they have the right to see her? I ask it seriously since I can't see what the problem is. Oh please. We love Madonna. Go to that wretched cult Madonnanation if you want to see a real desperation to hate. mean, where were everyone when Gaga performed in Russia and Azerbaijan for example? and Madonna doesn't have Israeli fans and even European fans who want to see her in Eurovision? People really don’t understand the concept of Eurovision. Oh well, the Queen remains unbothered. There will be always haters. 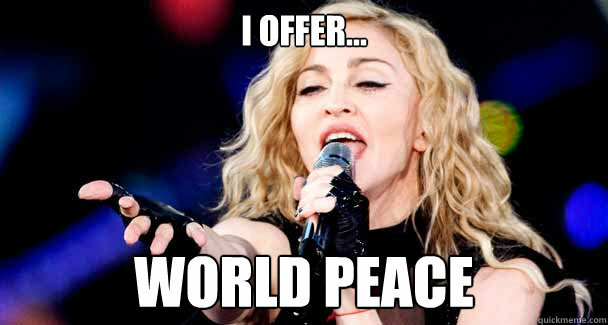 Meanwhile Madonna will lay at the beach in Tel Aviv laughing about all the “backlash”. Yeah, I didn't say the opposite, but I was curious about Gaga controversy since I didn't witness it.